Fans lined up to get a picture and an Arturo Fuente cigar from Carlos Fuente Jr. at last year's Big Smoke Las Vegas. 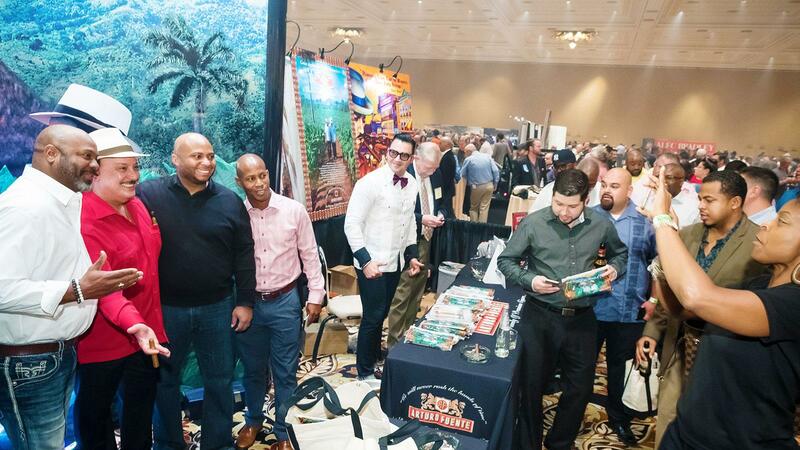 The Big Smoke Las Vegas is more than an opportunity to greet your favorite cigarmakers, participate in engaging seminars, and enjoy the camaraderie of fellow aficionados, it's also the chance to try an array of premium cigars that come included with your Big Smoke Evening ticket. Cigar Aficionado has released a partial list of more than 30 smokes that cigarmakers will be passing out during the Friday and Saturday evening cigar parties at the The Mirage Las Vegas Hotel and Casino. The list includes industry staples from names like Arturo Fuente and Padrón, as well as newer releases like Drew Estate's Pappy Van Winkle Tradition and the Oliva Cigar Co.'s Gilberto Oliva. Be sure to check back to CigarAficionado.com as more brands are added. For information on ticket prices, seminars and evening dates, visit TheBigSmokes.com.